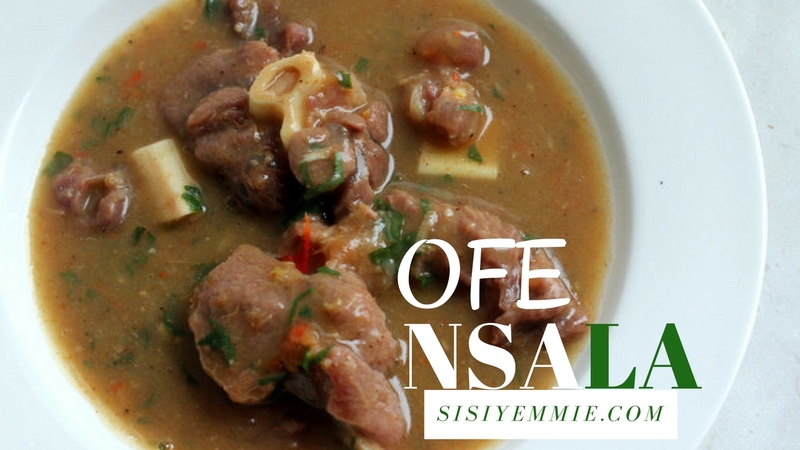 Ofe Nsala soup is from the Eastern part of Nigeria and it is extremely easy to make. Really easy. The ingredients you also need are not a lot. Some people prefer the Ofe Nsala wth fresh catfish but I like mine with goat meat. I would say these are the popular preferences. You can do chicken, beef etc but e nor go sweet reach the goat or fresh fish Nsala. Now, you need to find Utazi leaves-thats the new bae😍 in my pot of soups. I have the recipe written out for you below or you can choose to watch the short video (less than 4 minutes), don't forget to SUBSCRIBE oh so that my recipes land in your inbox one time! Warning: DO NOT copy my recipe text to your blog or website without my consent! You can share my videos but don't copy my recipe TEXT! Don't take my photos and remove my watermark, I will sue You and you will LOSE ALOT OF MONEY! Wehdone. Season goat meat with onion, seasoning cube, salt and cook till it is soft. I like it almost fall-off-the-bone. Add 2 slices of yam, cubed and allow it cook with the meat till it is soft. Add pepper soup spice, chopped habanero, dry blended pepper and some crayfish. While the meat is thill cooking, Take out the yam when soft and place in a blender. Add some water and blend till it is very smooth. Now add the yam paste back into the soup. The quantity you add depends on how thick or light you want the consistency of the soup to be. Add more water and allow the soup to cook for 15 more minutes, stirring it frequently. Add more crayfish and the sliced Utazi leaves to the soup and allow simmer for 5 minutes. Thats it! Ofe Nsala Soup is ready! I had this soup once in Nigeria. Very interesting flavours especially the Utazi leaves. Yum! You remember it well....Very yum! You did well. As an igbo woman, I was looking to see if you had the main essential, so you're not new to the nsala game. It's also great with fresh fish for those who may be dieting and a good alternative to oil soups as well as it can be prepared with or without oil. that's right...it's an oilers soup so great for diets! Thanks sisiyemmi,hubby best soup ,and it also very delicious with fish.I add ozizi seed and leaf to mine. Hmmm! Sisi, the cook! I want to be like you when I grow up o! Sisi yemmie, you should try Nsala with chicken(not frozen o) 'live chicken' and dried fish with correct pounded yam. The type of food that can send one to heaven. Back in the day, it was my mamas go-to-recipe before making a big request from papa. Lol. I saw this post at a time when I was hungry! Ahhh, Love love Ofe NSala. And I love it with fresh fish or goat meat or hard chicken. Lol. Always look forward to your recipes. Great job. You make cooking very easy. Thanks for sharing Sisi Yemmie. I go try am this weekend.